In case you were thinking of waiting until next spring to see color at MOBOT, think again. I visited the gardens just this past weekend and the garden is a long way off from dormancy! One of my favorite indoor spots is the Shoenberg Temperate House, with its distinctive Moorish Walled Garden shown here. 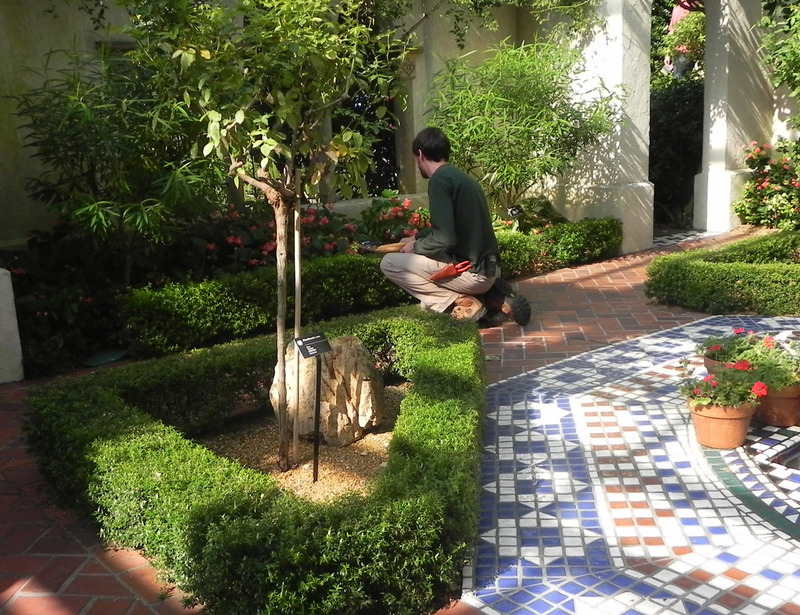 The young man is pruning the diminutive hedge, which he said is myrtle. Myrtis communis is a tender plant that serves this purpose well in such a formal setting. The Temperate House is just to the southeast of the Climatron, as is shown on the map. The Climatron covers more than half an acre and contains more than 1,000 tropical species, from edible to poisonous and everything in between. Although we spent time in the Climatron, there is more than enough color outdoors to satisfy my craving. 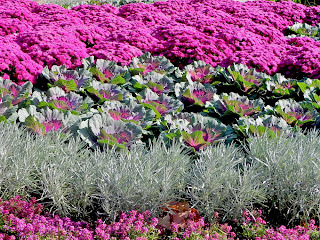 This combination of mums, ornamental cabbage, helichrysum and alyssum really puts the wow in autumn bedding schemes. Just outside the Linnean House, this freshly-planted bed captures both the eye and the imagination. The corkscrew vine lured us back again and again for a whiff of its gardenia/jasmine-like fragrance. Vigna caracalla is a tropical vine that grows quickly in full sun and hot summers, both of which were provided in MOBOT's Kemper Center for Home Gardening. This eight-acre section is one of my personal favorite sites for its ever-changing displays that offer tons of ideas for home gardeners. And for me, ideas and inspiration are the best reasons for visiting public gardens. 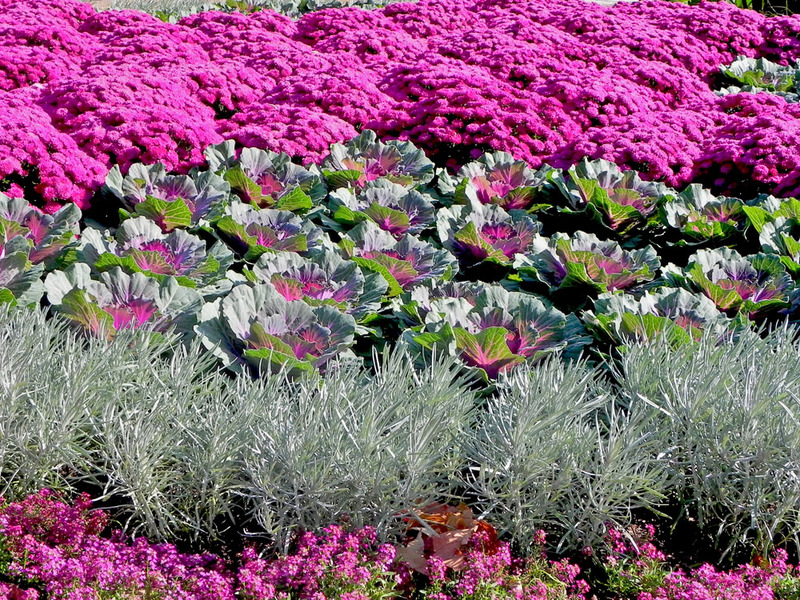 That planting of mums, cabbage, helichrysum and alyssum is spectacular. Fabulous colours. Loved the tiling in the Moorish Walled Garden. The garden itself looks magnificent.